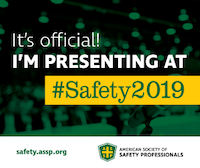 Safety 2018 ASSP (formerly ASSE) Annual Conference and Expo @ASSPSafety #Safety2018? *Additional fee and registration required. Concurrent sessions are identified, after the title, as the follow­ing based on experience. No-Smoking Policy: Smoking is not permitted at any ASSP function. Dress Code: Casual business attire, no shorts or jeans please. An ASSP staff member will be available to answer your conference questions. In addition, ambassadors, identified by yellow lanyard and welcome button, will be on hand throughout the convention center to help direct you. Get the most out of the conference by downloading the free Safety 2018 App. With it, you can pull up your personal schedule, view the line-up of sessions, com­plete session surveys, access slides and so much more. Available for Apple and Android devices, search Safety 2018. To login, use the e-mail address used when you registered and use safety2018 for your password. Don’t have a smart phone? You can access a web version, at safety2018.quickmobile.com. Evaluations: Electronic evaluations can be completed through the app or through the email link you will receive at the end of each day. CEUs: To receive CEUs, attendees need to be present for the education hours of the sessions and participate in learning activities provided. CEUs will be posted to your ASSP tran­script in approximately 30 days. Concurrent Session Recordings: Recordings are now included free with your full conference registra­tion. Watch 150+ sessions (all con­current sessions which our speakers gave permission to record) with video and slides synched to audio. You’ll receive an email with informa­tion on how to access our recordings a couple weeks after Safety 2018. Free access to the recordings lasts for 60 days after recordings become available. Look for an email from safety@csireg.com about your registration confirmation. This email will have your unique bar code and registration confirmation that you will need to bring with you to Texas. In Texas, just scan the bar code for express registration.